“Swaying to the Music” recently received this review and I thought it was very interesting! 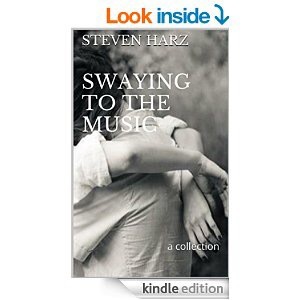 Steven Harz’s poetry collection “Swaying to the Music” reminds me a bit of an old coffee shop I used to frequent. There was always this older gentleman, I don’t think I ever learned his name, who would come in and play this unusual, atonal, arrhythmic music and do what we Germans call “Sprechgesang.” His song were half narrative ballad, half pure visual imagery. Harz’s poetry reminds me of this old man’s playing because Harz manages to maintain a musical quality without sacrificing other aesthetic qualities, creating complete works of poetry, whether they take the shape of longer poems spanning a few pages, short verses of a mere four lines or blocks of prose and short vignettes. The collection is connected through common themes of love, because what poems are not about love? And lost. My favorite poem in the collection is Cereal Box Decoder Ring, which reminds me a lot of my grandfather for reasons beyond the scope of this review. It is a poem which, at first glance, is about perhaps a lost loved one – a child or sibling, or even the narrator’s own sense of a lost or misplaced childhood. But that’s not what’s important about this poem. What makes this particular poem special is the way it uses these images to evoke childhood memories of pain and sadness and lost regardless of specific circumstance. This is what good poetry does, and Swaying to the Music is good poetry. Overall, I would recommend this book. It was definitely worth the few dollars I spent on it.